If you’re a fan of buffalo wings, you’ll love this Buffalo Chicken and Blue Cheese Cabbage Bowl! Make this tasty bowl meal in the slow cooker or Instant Pot, whichever you prefer! For a while now I’ve been a huge fan of Frank’s Red Hot Sauce, and this Slow Cooker (or Pressure Cooker) Buffalo Chicken and Blue Cheese Cabbage Bowl is one of the amazing recipes I’ve created using the spicy goodness of Franks. I love the spicy flavors of this hot sauce, but I also love the fact that it’s sugar-free, making this a very low-carb dish. And the way the chicken cooks in the slow cooker (or pressure cooker) without heating up the house and then gets cooled down with the cooling Blue Cheese Coleslaw and creamy crumbled blue cheese makes this perfect for a Summer Dinner! What do you think? Do you like the sound of this for an dinner that’s loaded with flavor? 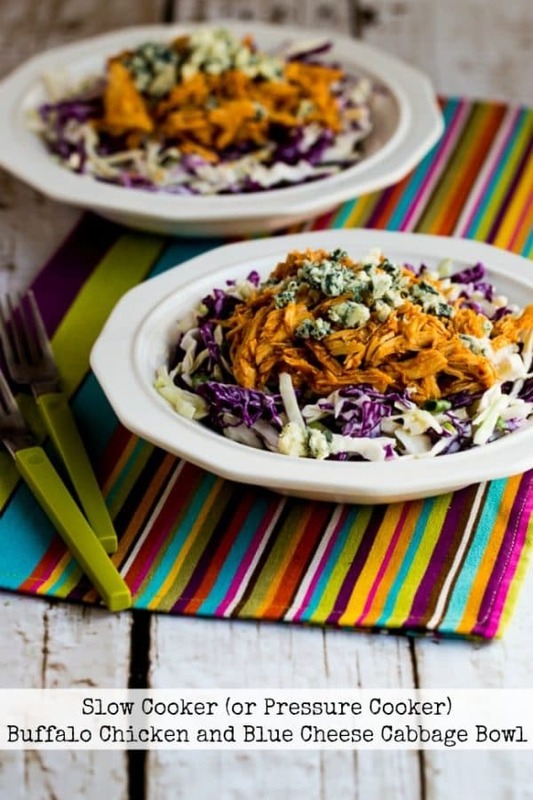 Get complete instructions for Slow Cooker or Pressure Cooker Buffalo Chicken and Blue Cheese Cabbage Bowl from Kalyn’s Kitchen. I used my favorite Crock-Pot 3.5 Quart Slow Cooker for the slow cooker recipe. Use a 6 Quart Pressure Cooker or a 6 Quart Instant Pot for the pressure cooker version. Check out The BEST Instant Pot or Slow Cooker Teriyaki Chicken! I love all of the flavors here, but just as much, I love the colors with the purple cabbage. Beautiful! Thanks Lydia! You know how I am crazy about cabbage, and I love this!